Another Joe Higgins Leaflet from the 1996 Dublin West By-Election. This time Ballyfermot focused. It was the election that put Joe on the map, as he came close to winning the seat won by our current Finance Minister Brian Lenihan. He asks Voters to vote for him and ‘Other Genuine Left Wing Candidates’ which is fairly uncommon. We also learn that in 1996 a TD earned £32,000 a year. In 1983 it was £16,400 a year .What is it now? 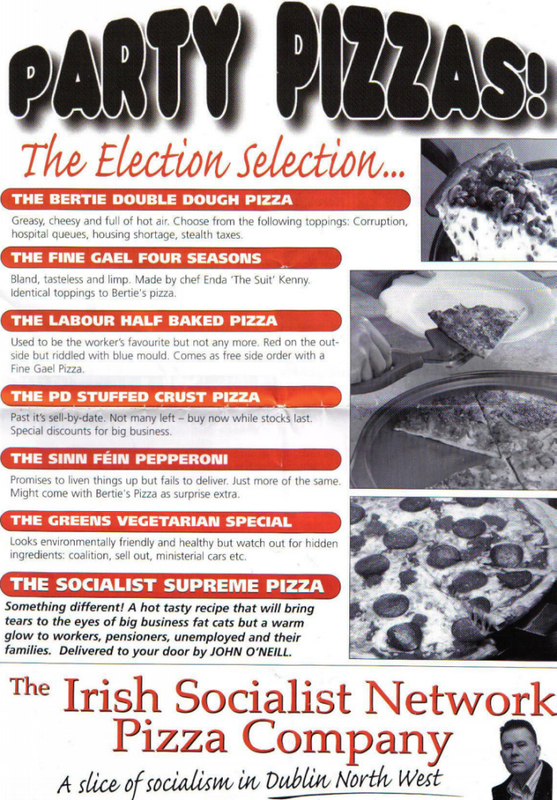 This is the back of a 4 page leaflet issued by the Irish Socialist Network for the 2007 General Election campaign of John O’Neill. Fantastic imagination, playing on the fact that election material is so often mixed in with Pizza Menus… and often the Pizza Menu is more popular! This is a recruitment leaflet from the Socialist Labour Party circa 1980. The Socialist Labour Party was short-lived, having been co-founded in 1977 by Noel Browne and Matt Merrigan (who both had been thrown out of the Labour Party). It finally disbanded just five years later in 1982. It fought the 1979 local elections as well as the 1981 General Election. In the 1981 election, Browne was re-elected to the Dail for Dublin North-Central. Other candidates fielded by the Socialist Labour Party included Billy Keegan and Matt Merrigan in Dublin North-West, Michael O’Donoghue in Dublin North-East and Dermot Boucher in Dún Laoghaire. None of them polled well. Matt Merrigan also stood for the SLP in the 1982 Dublin West By-Election. In the leaflet we have a piece from the Parties Constitution. Sections on its Policies and activities. Noel Murphy stood in a number of elections for the CPI in Cork during the 1980s. This is his literature from his Seanad campaign of 2002. It also illustrates in detail the CPIs policies. The text on the last page is small, hence It will need to be clicked on to be read. This is from 1994 gives Waterford Glass , Tony O’Reilly and others a decent mention. 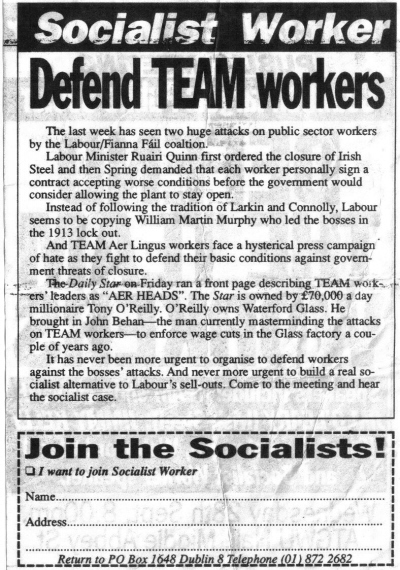 Jimmy Kelly of Waterford glass was an SWP candidate a few times in Waterford.